I am making a chicken cacciatore for Sunday dinner and I wanted fresh bread to go with it. While I have made white bread and other baked goods many times, I have never ventured into crusty bread territory. Bread is simply a mixture of flour, water and some kind of leaven, but the results can vary widely depending of the differences in handling—both before and during baking—and with the addition of a variety of ingredients. The secret to rustic Italian bread is in using a well developed “sponge.” To make a sponge you mix part of the flour, water and yeast into a very wet dough. You then let this dough ferment for 6-24 hours creating a very “spongy” flavorful mass. This sponge is then used as a starter with the rest of the dough to make the final bread. As well as adding flavor the long resting gives the yeast time to fully develop. This abundance of yeast causes the large gas bubbles that give this bread its distinctive open chewy crumb. There are many reasons to add salt to bread, but salt slows down the growth of the yeast. If you are using the sponge and dough method, never add the salt to the sponge. The purpose of a sponge is to let the yeast “go wild,” you do not want to add anything that will slow it down. The first ten minutes of baking is critical to both the crust and the interior crumb of your final loaf. If you put the finished dough into a dry oven the heat will quickly cause the crust to form and stop the “oven spring”—the final rising of the bread before the formation of the crust locks in the shape of the bread. While this will produce a soft crust, it is strong enough to prevent the gasses inside the bread from expanding and produces a dense tight crumb. If you put the same loaf in an oven with a lot of moisture—by adding a pan of hot water and spraying the walls of the oven—the formation of the crust is slowed down. The gasses inside the dough have more time to expand and create an open, “holey,” and chewy crumb. In the moist oven, the starches on surface of the dough also saturate with water and rupture turning into a gel. When the crust finally forms, this starch gel hardens into the distinctive crisp/crunchy crust of these breads. The more moisture there is in the oven, the more of this gel will form and the crisper your crust will be. After Dinner Note: This turned out very well for a first attempt. The crust was crisp and the crumb tender. It was the perfect vehicle for sopping up the cacciatore sauce. It was very popular with my dinners. Next time I won’t kill my first sponge and I might get closer to a ciabatta level of chewy crumb. 1. Put one quarter cup of warm water in a medium bowl and stir in the yeast. Let it rest for 15 minutes until foamy. Tip: This is called “proofing” your yeast, to make sure that it is active—i.e. still alive. 2. Add the rest of the warm water and sift in the flour. 3. Stir the flour into the water until the thin dough is smooth and lump free. 4. Lightly cover the bowl with plastic wrap and set in a warm place for 6-24 hours. Tip: You do not what to seal the bowl “air tight” with the plastic wrap. This would slow down the formation of the yeast. Note: If you set the sponge bowl in your oven overnight, remember to remove it before preheating your oven for scones in the morning! I had to start over—a baked sponge never rises! 5. Put one quarter cup of warm water in a large bowl and stir in the yeast. Let it rest for 15 minutes until foamy. 6. Add the rest of the warm water and sift in two cups of flour. 7. Cover the bowl with a clean, damp, dish towel and let the dough rest for 30-40 minutes. 8. Stir the sponge and salt into the dough, until well mixed. 9. Add one cup of flour, half a cup at a time, until you have a soft dough. 10. Turn the dough out onto a lightly floured board. 11. Using a board scrapper and only as much flour as you need ( ½ -1 cup) to keep it from sticking, knead the dough for five minutes, until smooth. Tip: Use only as much flour as you need. It is easier to add flour to a wet dough than to add water to a dry dough. 12. Form the dough into a ball and place it in an oiled bowl. Tip: Wipe the top of the dough ball around in the oil and then turn it over. 13. Cover the bowl and let it rise until double in volume, about one hour. 14. Using a spatula, fold one edge of the dough into the center. Fold the opposite edge of the dough into the center and then fold the resulting packer in half over itself. 15. Let the dough rise for half an hour and repeat step 14. 16. Let the dough rise for a second half hour. 17. Place the baking stone on the top rack of the oven and preheat the oven to 500º F.
18. 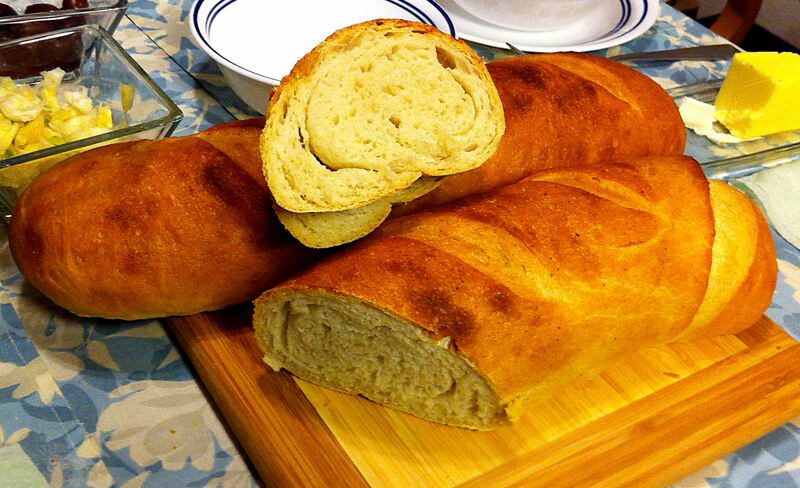 Turn the dough out on to a bread board and divide it in half. 19. Form the dough into two long loaves and place them on a sheet of parchment paper, four inches apart. 20. Slide the parchment paper onto a oven peel and let the bread rise for 20 minutes. 21. Place a baking pan with one quart of hot water on the lower rack of the oven. 22. With a sharp knife, slash three diagonal slices across the tops of each loaf. 23. Spritz the top of the loaves with water and slide them onto the baking stone, parchment paper and all. 24. Spritz the sides of the oven well and close the oven door. 25. After 10 minutes, reduce the oven temperature to 400º F.
26. Bake the loaves for 25-30 minutes, until well browned. 27. Remove the loaves to a wire rack to cool for ten minutes before slicing or leave them whole for the dinners to tear apart.